Firstly there were the Horoscope-thermometers — which need adjustments that are different for each calendar month of the year – up in December, down in January, up in February… These thermometers flip on Jan 1 each year from reading nearly 1°C too warm all of December, to being more than 1°C too cold for all of January . Then come February 1, they flip again. Somehow the BOM managed to unravel this bizarre pattern (cue X-files music) and figure out exactly what anti-horoscope-adjustments to use (and they were different in every city). Modestly the BOM did not explain to the public how clever their adjustments were; despite their $300m budget, it took volunteer Bob Fernley-Jones to reverse out the Special Horoscope Cure, and find the square wave algorithm that repaired our damaged climate records. Lucky for the BOM it’s all laid out below. Fernley-Jones had a theory that the best thermometers were in our biggest, richest capital cities. Instead he found fickle unreliable thermometers everywhere. Adjustments didn’t line up with the times the stations had moved. Sometimes the maxima step changed, but not the minima. It was as if the Bermuda Triangle rolled through the data. I asked Bob to tell me the best stations (the BOM would want to know). He laughed. Below he continues his exhaustive, diligent analysis of rural stations and finds the same old mess as he saw in the capital cities. And on it goes. Hours of work. Bob Fernley-Jones does a special kind of graph which packs in 30,000 data points, looks a bit scary, but don’t be put off, the natural noise is easy to tell apart from those sharp man-made step changes. In a normal world there would be just as many step-downs as step-ups as adjustments went both ways, there would also be reasons for the steps (pah!). In a warming world where an ocean of concrete and bricks had been built near thermometers, the adjustments would step down to compensate, as those lines tracked from left to right across the page (but they don’t seem to). Guest Post by Bob Fernley-Jones. Corrupted Australian Surface Temperature Records. This is Part 3 of a series of studies that investigates the credibility of the Australian Bureau of Meteorology (BoM) homogenizes surface temperature records. Before this, Part 1 covered six State or Territory capital cities in the expectation that those stations had the best resources and robustness in long-term record keeping. Unfortunately, even these iconics were not found to meet the institutional claim of “World’s Best Practice”. That aside, it is now time for a wider look and comparison with some long-record rural sites where the Urban Heat Island (UHI) effect, as it is well recognised in big cities, is generally not a complication. To avoid any suggestions of cherry-picking, a greater number of twenty-four rural sites are herewith exposed. Also briefly considered within the total 112 ACORN sites are those with relatively recent start-up dates. (17% are short-record sites with an average of only about 59 years timespan through 2014, not the proper full 104-years that the Bureau claims to cover since 1910). Importantly, this report summary, compiled from almost 80 megabytes of data, is NOT about the methodology that the BoM has used in its homogenization (or any “climate change” theories). Instead it is simply a test for reasonableness in the Bureau’s resultant “corrected” DATA over that of their currently published “raw data”, (regardless of HOW they got there). 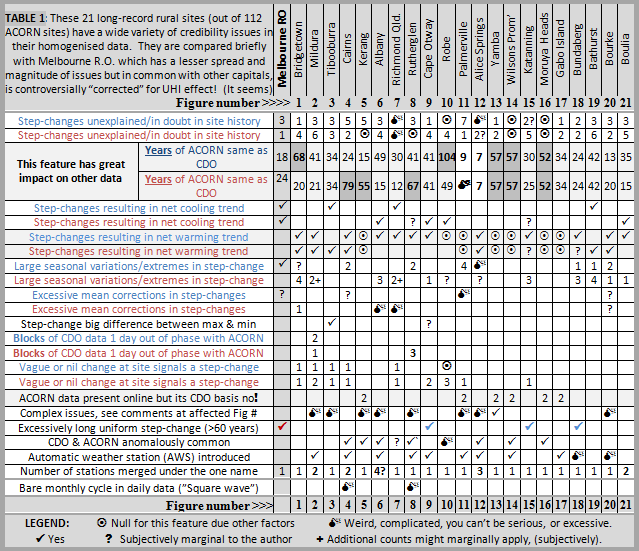 By raw is meant those recently retained records at the BoM website; ‘Climate Data Online’ (CDO). (Although in six of the examples to follow, whilst ACORN data is present online, the CDO daily information upon which it is believed to be based is not available online!). The BoM homogenised data are officially known under the acronym; ACORN – SAT (abbreviated to ACORN here). In order to explore any anomalies in the quality of that data the methodology used was to electronically subtract the downloaded CDO daily data from ACORN and then chart their differences for visual comprehension of any strange patterns therein. The software employed was the widely accepted Microsoft EXCEL. In firstly revisiting the Melbourne chart, it serves several purposes including that it is visually less complex than most rural station charts that follow, but is useful as an introduction to what are rather unusual graphics. Perhaps most unique is that daily data spanning >100 years, (or about 38,000 data points), are compressed across a single page width. There are consequential limitations in pixel definition and visual clarity, but nevertheless annual cycles are generally evident, and, in some cases, in the later charts some selected details are expanded in scale for improved definition. NOTE: In these charts, ‘anomalies’ are meant in the sense of incongruous outcomes in the differences obtained after subtraction of CDO (raw) temperatures from the ACORN (“homogenized”) temperatures. History from the ACORN catalogue: The current site is located on the grounds of the Post Office in the town centre, over lawn with a concrete path nearby and a number of buildings within 20 m. History: There was a small move (10 m) in November 1935. The screen was replaced in January 1942 and in January 1998. This 104 year-long single station record is one of the “World-Class-Quality” 112 ACORN sites. It was selected for having multiple concerns, although they are not individually the most extreme out of the examples to be revealed later. Area of interest ①in this chart shows in the ACORN adjustments over CDO, a sharply seasonal cycle of extremes in the maxima ranging some 4⁰C, whereas in the minima at less than 1⁰C, there is hardly any seasonal influence, (seasonal profile). Area of interest ②shows lesser adjustment but there is a starkly illogical difference in the seasonal profile each side of ~1982. These seasonal differences are in highly regimented cycles prolonging for decades without any apparent reason or logical thought to be discovered in the site history. The large change in maxima temperature anomaly range in the 1920/30’s is not credible in proportion to the many other prevailing periods. These issues should not be found at even a single station in ACORN’s tax-payer funded “World’s Best Practice”. History from the ACORN catalogue: The original site (076077) was within the Mildura town area. It moved in August 1927. After this move the screen was oriented northeast, but it was realigned to face south in July 1933. There was a small site move in March 1943. Temperature observations continued until 1949. Observations have been made at the airport site (076031) since 1946. Site moves took place on 11 August 1992 (from the aerodrome apron to the Meteorological Office) and in July 1989 (only a small move). The automatic weather station was installed on 1 October 1989, and became the primary instrument on 1 November 1996. There was rapid development of irrigated agriculture in the Mildura region in the period between the two World Wars, and this appears to be associated with an anomalous cooling trend in maximum temperature at Mildura over this period (amounting to 0.3–0.4°C over 30 years). The non-ACORN-SAT site of Griffith, which has a similar history of irrigation development, shows a similar trend. A new issue found herewith is a modest example at ①+① of data corrupted by CDO records being out of phase with ACORN by one day. (like Monday data being subtracted from Tuesday’s). A much more extreme example is found in Fig 8; Rutherglen; with its three prolonged blocks of corrupted data. The rather different looking annual profiles at <②> and prior to ~1946 are partly the consequence of much missing data, resulting in very many zero values. EXCEL found over 11,000 values missing in ACORN over the full 104 years, but they are predominantly before ~1946. (BTW it is possible, but impractical to plot that concern here, because it would visually over-clutter the image in this case). History from the ACORN catalogue: The site has had a number of moves over time. There is evidence of a move in November 1944 and a small move in 1960. A 500 m move to the southwest occurred in August 1980, and there is evidence of a move of a few metres some time between 1981 and 1984. There were moves of a few metres in September 1994 and of 15 m to the south in July 1996, to place the screen away from areas of bluestone landscaping and concrete, although neither move has had a significant impact on the observations. Minimum temperatures at Tibooburra suffered from persistent problems (most likely instrument faults) in the 1940s and most 1941–1949 minimum temperature. This chart spans some 38,000 daily data points across a mere page width and consequently the limited pixel definition misleadingly results in apparent mass blocks of colour at ①&②. Thus a clarifying expanded detail view is provided to the right in this image. A stand-out issue is that highlighted <<<①>>> showing for almost a decade that the minima are devoid of data, whereas the maxima do have some data but still with many zero values. For some 22 years there are many missing data in both minima and maxima as elaborated in the expanded detail view. Missing data in ACORN over the full 104 years are found by EXCEL to embrace 5494 and 2630 days. Minima temperatures have been increased in ACORN, by an average of about 1⁰C (by eye) prior to 1940 together with unaccountable strong seasonal variations. This results in a cooling trend in the minima versus CDO. Documented site changes shed very little light on these issues. This long series single site record does not pass the ‘test for reasonableness’, particularly before 1960, and surely cannot conform to “World’s Best Practice”. Fig 4) Cairns: Every station is unique in its data! Here, ACORN is the same as CDO in the minima back to a site move at the airport in 1992, but in the maxima they are unaccountably the same all the way back to about Dec/1934 (80 years). This arguably amounts to a loss of publically available information on how & why ACORN became the same as CDO in the maxima over such puzzlingly greatly varying periods! It gives rise to some potentially disturbing speculations! Prior to that mysterious 1934 event is revealed an astonishing underlying algorithm showing a monthly cycle that is devoid of the daily data that is foundational to its source. (!?) This is discussed in more detail in Part 2 of this series of studies (see link in References) and is seen in several other sites, including Rutherglen; Fig 8; following herewith. The eight step-changes here typically show little correlation with the documented site history. Notice for instance that in a documented move in “December 1929 from a relatively enclosed site to a slightly more open one” that the maxima were adjusted in ACORN upward, but the minima down. This site record and the associated BoM practices do not conform to a credible claim of “World’s Best Practice”. History from the ACORN catalogue: The site has been within the township since it was established. It moved in August 1932, June 1956 and June 1957; the latter placed it in a yard within a built-up area which was cluttered from time to time. The screen was noted as being incorrectly oriented in November 1945 and again in February 1968. The site moved 1 km north to its current location on 18 January 2000. In this case, as an alternative graphical elaboration the missing data in ACORN are plotted as highlighted typically at ②, (this alternative graphic methodology becomes of greater significance in some later figures). History from the ACORN catalogue: The original site (009500) had several locations in the town. The site moved in May 1913, February 1916 (unconfirmed), 1925 and 1950 (only a small move). Observations commenced at the airport site (009741) in April 1965. There were no overlapping observations at the time. However, in 2002 a site was re-established near the former town site and using its number, and the post-2002 observations have been used to estimate suitable adjustments for the 1965 move. There has been one known move since the site has been located at the airport, 150 m to the northeast on 4 August 1992. An automatic weather station was installed at this time and became the primary instrument on 1 November 1996. Re-establishment of a site in-town to cross-calibrate the move to the airport some 37 years after the event is maybe; better late than never? How can we be confident of our BoM in claiming its ACORN sites and practices are “World’s Best Practice”? The focus of this study has been on rural stations having long records, mainly because the BoM homogenisation process has greatest relevance the older the data is. Preference has also been for single station sites for ease of process, but there are many stations of one name but which are actually multiple stations merged together, (commonly originally in-town location/s then moving to outlying airport location/s). There are also a significant number of ACORN stations with short records (E.G. 17% are with start-up dates between 1950 to 1975). Some of these are likely to have effectively no researchable data online because CDO is typically the same as ACORN over those shorter terms. Unfortunately to fully confirm this would be labour intensive and beyond my current intentions. This table is available as a Document.docx and a PDF version. A controversial aspect that has been debated elsewhere is that the adding of new ACORN short-record stations* in hotter regions has resulted in exaggeration of recent warming trends. On the other hand, there are many abandoned older sites, (commonly at retired institutions such as Post Offices), which ought to be of importance in improving sample size for the declared objectives behind ACORN. However, prima facie this seems to have been seriously neglected by the Bureau. Almost half of the total 112 ACORN sites have been researched in Parts 1, 2 & 3 and yet more in continuing review, and ALL of them exhibit various data problems of similar severity to that exposed here for both long and short-term records. The ACORN DATA do not pass any test for reasonableness and thus cannot be properly used to assess any warming trends in Australia over the past century. Sortable list of ACORN-SAT stations with linked DATA. I’m a retired mechanical engineer with no past or present funding for my subject research from anyone. (Or interests other than in wanting proper scientific integrity and effective use of government funding in science). It is no wonder they are unable to forecast tomorrow’s weather. It’s just as well, then, that tomorrow’s weather hasn’t yet applied for homogenisation. Never forget that in ‘climate science’ only the future is certain, the past is always changing. I can see what they are doing – if the data is “homogenized” its near impossible for people later on to prove the data wasn’t “correct” to start with ( as it all disappears ibnto the memory hole…)- as such they are doing a classic communist tactic or “re-writing the history books” to make thier view of the world “correct”….. When you abolish any known reference, it makes the holder of the “data” the “truth”. The Amish in the USA are being targetted the same way when it comes to health….they are healthier than the general population, and the powers that be dont like the fact they are a control group….shows modern medicine in a bad light…. The unhomogenized data is available. The daily temp measurements are not adjusted. There is no conspiracy – it is a made-up story. The unhomogenized data is available. Unfounded assertion. Please provide a link to the complete un-homogenized temperature record for the ACORN data set. EXCEL found over 11,000 values missing in ACORN over the full 104 years, but they are predominantly before ~1946. Some data is available. All of it is clearly not. The daily temp measurements are not adjusted.
. . . compare the average unadjusted data with the average adjusted data. Not much difference. Both data sets show warming. One things have have learn over the years, some like to misrepresent (straw man) the process of homogenization. My challenge to them is come up with a better method if you do not like the BOM’s method. Self contradiction. IOW, a lie. You know the temperatures are adjusted and you even defend BoM’s method by ‘challenging’ others to come up with a better way of doing so. The unhomogenised data set is called AWAP. ACORN is a derived data set, go read the BOM website. You really have no clue, do you? Stop trying to waste my time, you are one sad sad individual. I know what it’s called. Where is the link to the complete un-homogenized data set. Including the 11,000 missing records. You have not provided one. What’s your response to the self-contradiction about homogenization? You’re quoted as both defending it and rejecting it’s existence. Of the two statements you made, which is the lie and which is the truth? I found that BOM and other temperature homogenizers stick by the assumption that the only reason temperature trends vary in direction or over time from one place to another is because of measurement biases. That is the thermomters are wrong or the enivoronment around the thermometers has changed. In reality, trends vary from place to place. One consequence of this variation is the more thinly spaced the thermometers the greater will be the adjustments. The Australian BOM will claim that they did not deliberately manipulate the data. From what I have found is that this claim will be true – they just do not understand what they are doing. Sorry km (mbc). Could you please write this again. I did look at the links and I think I see what you are getting at but as you’ve written this it is a bit weird. “from one place to another”, I think we can easily find examples of where that is wrong… Umm (borrowed from tony from) …Moscow and Darwin? You are quite right in your observation. I rushed it out during my lunch break. I will try to clarify later. The comment will get stuck in moderation, as there will be a number of references. I tried to be concise in the rewrite, but ended up writing nearly 500 words, with an illustration and a number of references. Too much for post, and images do not appear in comments. So I have done a post on my own blog. 55 years ago, as an experimental scientist, if I had [snipped] (homogenised) the data to suit anyone’s preference, my arse would have been kicked so hard that I would not have been able to have sat down since. The first mathematical model of o mineral flotation circuit was developed by an outstanding metallurgist at the Zinc Corporation in Broken Hill (and later Bougainville Copper), Bill Davis. He started with about 30 variables and concluded that there were too many variables in his model that were of little or no significance. This bunch of rank amateur “climate scientists” (many of whom are PhD’s or witch doctors???? ), have conned the world with models which have a single variable which has an enormously high probability of being meaningless in relation to climate parameters. I had a bad experience with mineral flotation. Just working as a lab monkey but was astounded at the inability of experts to fix a minor problem because it wasn’t something that had been done before. Whats the point of being an expert if you merely parrot consensus? Kevin I think somebody ordering the Homogenisation higher up knows exactly what they are doing. There has been a lot of what borders on conspiracy theories, too much so in fact, appearing here on Jo’s blog recently particularly when certain subjects and organisations or persons of interest as the cops would say, are being discussed and debated. So a quote that is obviously becoming very applicable to so much of what passes for climate science today including that of the BOM, plus climate analysis by a whole Augean Stables worth of wouldbe and wannabe climate modellers and climate scientists all busily promoting a “virtual ” science,[ it only exists by appearing to be there and because somebody says its there,] of a very doubtful and dubious veracity. And then they proceed further by parcelling that “virtual science” into an overweening power seeking political climatology as expressed by selfie promoting climate science incompetents seeking to sway the climate science ignorati of the grave dangers of the climate’s inconsequentials all based on nothing more than the modeller’s climate imbroglio. Meanwhile the real climate just gets on with being the Climate wherever, whatever and however it might be. A quote that eminently fits climate catastrophe science and its promoters and practitioners, a quote which should be heeded and remembered by everybody who partakes of this discussion. In any group there are a few rotten apples. Is 97% incompetence possible? Yes. It’s there 97% of the time. Incompetence would explain the situation for a time, but we’re going on 20 years of demonstrated nonsence. We also know there are powerful backers and a great many gravy-trainers involved. Giving awards for incompentent conclusions doesn’t help either. Upon reflection, you might be right. It’s the handing out of awards for incompetence that has confused them, and they can not see or understand that they are wrong. No matter how many people or times they are demonstrated wrong. They won an award for their work, it must be right, right? I agree with you that we should not shut out alternative theories for happenings. Recent discussion points have been the Tony Abbott thing, the Homogenisation and as you mention above the whole Climate Science shemmozzle. and think that it may apply to two of the cases above but not that of Temperature records of the Australian BOM. I think we have been deliberately dudded there. On the general climate thing it would seem that only those equipped with and willing to use their relevant scientific training can pick out the fraud. That leaves the great mob out there braying for Klimate Action as the victims of their own “utter incompetence” to assess what is real and what is fraud. You cant really blame them, after all who wouldn’t want to save the planet. See George Carlin on youtube ; a scream. The Tony Abbott thing is not so clear. Yesterday I heard a radio broadcast which depicted TA as someone who did a great job as opposition leader but who does not have the skills for the main job , and Peta came up as an issue. Many sane people in the libs were said to have approached him to give advice only to have it rejected. malicious gossip or the real reason? It sounds logical to assume that Mr T was only made PM because he was the only current alternative. If he goes through with any excess climate action then we can go back to the original concept most of us had that TA should have been left to run the country. Malice is not necessary to have a conspiracy. In fact if BOM scientists have agreed upon the homogenization algorithms it does (to me) meet the definition quoted above. Conspiracies need not be “vast” or “evil”. In my opinion, “group think” generally will result in conspiracy. Yes, but there are a lot of pointers that indicate incompetence is not an adequate explanation. Consider this; if the official scientists were merely incompetent, they would be more than happy to show off their methods. The fact that they will not completely and clearly explain how they get their “adjustments” is very strong evidence that they KNOW they are malicious. KK I agree, those $millions spent homogenizing the data were spent for a reason. And that was to try and make ACORN stations show a spatial and temporal increase in warming in Australia. As we see in this post, it looks as if at times they even failed in this task because their station adjustments for individual stations seemed to vary all over the place without logical reasons, even though the national scale met their desires for manufacturing global warming. What a horrible mess. I doubt if Australia will ever restore their historical temperature records. If there ever is a thorough forensic analysis, look for much of the original data to be “lost”. Based on the climategate emails, it looks like the original readings of the thermometers around the world have been destroyed as well. Thanks to Mr. Jones at UEA, it may take to the turn of the century to know the true global climate change. I agree with ROM on this. There is no conspiracy here. Rather you people at BOM who despite being well-qualified and very talented have very firm beliefs about what the data should look like, make unquestioned assumptions and fail to critically review the results of the complex number-crunching that is involved in homogenisation. Bias on the part of experts who passionately believe in a cause is not unique to climatology and is not necessarily a bad thing. The Police are passionate about getting criminals behind bars. Medical researchers want to save lives through new wonder drugs. But in both those areas it is accepted that passion can lead to outcomes being one-sided. Without critical evaluation and objective standards we recognize that there will be miscarriages of justice in the judicial system and new drugs arriving on the market that could be both ineffective and with adverse side effects. I did reply to ROM above but I’m not sure whether even he included the Temperature Homogenisation in the “no malice” category. My grandfather had a lot of chooks and used a mercury thermometer for the hatching setup. That’s just a piece of junk info but my point could be that old thermometers can be read to plus or minus half a degree F in the old days and C now. The main variable is where you place the thermomenter. I can think of one place where it would be 98.6 deg F.
Placing measuring gear outdoors for temp taking is an exercise in extreme variability because conditions vary greatly from place to place. I do not understand why so much effort has been taken to resurrect an old irrelevant set of data but more importantly the basic treatment of the data does not measure up to the levels of scientific method that real science would accept. Homogenisation is a rubbish concept and is in it’s right place as an accessory to Klimate Science. Both are rubbish. The whole homogenisation thing stinks. If they were honestly mistaken they would not refuse to divulge how the “adjustments” are calculated. Finally a post to distract me from the current state of politics in Australia. They wanted a trend and they got it. If they were honest they’d be looking for cycles and patterns in order to understand, But no they wanted a trend because a trend demands political action, by them for our (their) supposed benefit. Pity for them we followed the pea. Climategate email that verifies what you and Ceetee allude to. Kevin Trenberth to Michael Mann, Oct 12, 2009. That’s a gem Ian, it made my blood boil. Those who demand action do not even critically check their own data. 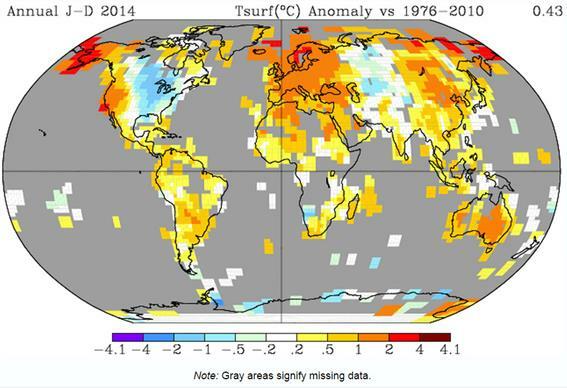 Below is a NASA GISS temperature anomaly map for 2014 against the 1976-2010 average (land only, 250km smooth). Despite being homogenised and smoothed there is cooling over much of North America. In Alaska there is warming of 2-4 degrees. Global Warming cover most of the land, but there is considerable variation. The ‘warming in Alaska’ was based on a carefully chosen temerature station and used to average out across the rest of Alaska. There was a fairly detailed deconstruction of this over at WUWT a while back. I bet that little “trick” has been employed in many parts of the world. Was the station at Anchorage Airport or somewhere suitably similar? (never saw the WUWT article). The higher than average warming in Alaska is due to it being within the Arctic. Here massive swings in temperature are common. Most extreme is Svarlbard Airport, where the raw data showed average temperatures in 2006 a full 7 degrees higher than in 1976. But at nearby Isfjord Radio (the weather station moved in the mid-1970s) average temperatures were almost 9 degrees higher in 1938 than 1917. Homogenisation reduced both these trends, but the early twentieth century warming ended up being smaller than the late twentieth century warming. Is there any indication within the data that suggests when these adjustments were done? Is there a chart of BOM’s management structure which may give a clue to which internal department or work team may have executed these adjustments? Where do they drink after work? Or is it before work? You are probably right, at what level do these decisions come from. One has to remember that promotion at higher levels in government bureaucracies is a decision of the relevant Minister so the axiom of the public service to provide frank and honest advice can be tinted by political consideration. Who advised Kevin Rudd when he set-off to Copenhagen? Where did Senator Wong’s proclamations on global warming come from? Probably from like-minded folk. This has been my worry all along…. How many people does jt take to perpetuate this con? Two? Three? A whole department? I still cannot believe students of the scientific method would fall for this group think. Go back to your science classes and labs during your primary education. You took measurements and developed data sets. Did you then go and adjust the data so that it would indicate a pre-supposed/expected/needed result? Garbage in = garbage out. Excellent point. This wouldn’t pass for junior school science class. What has gone wrong with science education? If the data was that bad it perhaps should have been DISCARDED? The other very real issue is that the BOM has spent a lot of money on this retroactive thing for a REASON whose only object must be related to Proving the Climate Change thing. The BOMs job is to measure what is happening now and get that right so that FUTURE records will be more reliable; how are they going?. The last and most important point is that the 100 year temperature record IS TOTALLY IRRELEVANT to real climate science which operates on a cycle of about 100,000 years and has done so for several million years now. What earthly use is a BOM record of 100 years when orbital mechanics determines that a cold snap will begin every 100,000 years or so and include an interglacial of 20,000 years. 100 years of temperature records are totally unimportant. “The BOMs job is to measure what is happening now and get that right so that FUTURE records will be more reliable; how are they going?”. I’m working on a proposed Part 4 covering the last two decades to end 2014, together with some comparisons with earlier times including before and after decimalisation in 1972, (a distinct break-point in types of data corruption). Recent times are arguably more bizarre than in the past in terms of daft data, but in entirely different ways. (based on data from over forty sample comparisons). As one eminent scientist said to me once when we were discussing climate science, their data is crap. That is no doubt true but that comes about because their brains are crap. My suggestion is that the current emphasis on incorporating those with disabilities into the work force is the driving force in the rise of the alarmist sect of ACC. Of course that may also be the reason why many naive, as distinct from malicious, politicians embrace this UN wealth redistribution scam. HT’s brilliant contributions was an important stimulus in my discovery of this link. An anecdote about non-matching correlaries. A difficulty in analysis of historic temperatures is that we have not gold standard — by which I mean a measurement which is standard over time in its collection and reporting. One hopes that in the future the satellite record will serve. I live in Florida, in the US, on the edge of the citrus belt. 50 miles north, and there is only ornamental growing by individuals. 50 miles south and the commercial groves still thrive ( if one ignores canker, greening, and competition from Brazil). In my county, in a marginal year, a grove just south of a lake may yield well, while one in a slight hollow (where the cold night air pools during a freeze) might bolt completely. The citrus industry accurately reports yield by counties. In the 40′s the reporting of warm and cold years for four decades tracked with the temperature reporting. Over time, the historical fruit yields have not changed, but the temperatures of the same time periods certainly have. Now I’m pretty sure that citrus yield is no more valid than an Yamal tree as a proxy for temperature; but the change in the historical correlation over time is disturbing. There is a chap here collecting much US data for analysis on a similar basis to this article. Huge job requiring much and frustrating computing. Eventually one hopes we will have someone in power willing to do a full audit, and the contribution of selfless individuals actually doing the research as in this article, rather than simply telling stories like mine, will be proparly recognized. Good work. Which they then proceed to ‘correct’. John Cleese has the answer. Apropos of the ‘climate’ in Oz but O/T wrt homogenisation, Prof. Murray Salby returns. With a vengeance! Climate Scientist Murry Salby Returns! With commentary towards the end by Monkton of Brenchley. The conclusion to take from this is how can any policy ever be reliably made on movements of a degree of global warming over a hundred year period. The adjustments seem to suggest that the error bars would be bigger than the purported rise. This is really a clear example of trying to rewrite history. And trillions of dollars are spent based on this data. It’s frustrating that the scandal of these adjustments is not more widely known other than the priveledged readers of these skeptical web sites. Even if it was more widely known there are too many vested interests controlling the agenda. This is what 95% certainty looks like. Each station is different, and the BOM can’t and won’t explain how they got the result. It would take too much training and operator intervention to recreate the ACORN set independently. Jo just a quickie, what’s the difference between ‘Homogenization’ and ‘Smoothing’?, if there is any, cheers. A better question is, what is the difference between homogenisation and lying? Yonniestone [ as an old timer who is familiar with that old usage of "Yonnie" to describe a small stone, I love your handle ] I’ll have a go at your question . And I stand to be corrected if I have it wrong. Homogenisation is a term that might be somewhat of a puzzle as to what is being implied to those amongst the browsers and lurkers on climate sites who are not fully up to speed with much of the arcane terminology that is a feature of most scientific disciplines. “Smoothing implies a flattening out of data in this case, that removes the humps, bumps and hollows and leaves a fairly flat and featureless set of data. Smoothing can apply to just one site or to whole collective sets of data right across the board. “Homogenisation” is used in Climate science to remove all the small jiggles and bumps and sharp changes and most importantly, removes the major differences by adjusting the stations data between two or more similar but geographically distant stations to approximately match but still allowing significant common trends and significant changes in the commonality of the various station’s data. The homogenised data in climate science generally covers a number of supposedly adjacent stations, up to 1200 kms apart in the BOM’s homogenization algorithm if you can get your mind around that level of irrational climate alarmist science thinking. Homogenisation of weather station’s data really only has one underlying purpose and that is to try and detect common to all, trends and changes over large distances and long time spans. Homogenisation is an absolute essential for climate science modelling as climate models, given the current computer power, are utterly incapable of analyzing each and every single point of station data recorded over the last century. So to try and derive some sort of trend in the climate, the data covering many stations is first homogenised to bring them into some sort of agreement on their trends and thier changes and to remove any apparently glaring anomalies, even though those glaring anomalies may actually be a true reflection of conditions and trends and specific to any particular station. The whole homogenisation exercise that has morphed into a mightly corrupted tax payer funded, climate modelling industry entailing hundreds of billions of dollars. it is now based almost entirely on incompetently carried out and inept assumption laden modelling of climate predictions carried out by a whole host of carpet bagging climate modellers who between them have very little actual real time weather and climate experience and real time watching of the real world climate in action over a few decades of a lifetime. Without homogenisation, the smashing up and collectivising of the multitudes and masses of global station data, there would not be a climate modelling science industry as there is not and won’t be for many years yet, sufficient computer power or the unbiased algorithms available to process all that data collected since weather data recording first began. Climate modelling is “ivory towerness” exemplified in all its ignorant and hubris laden glory. And homogenisation of the data is it’s essential bread and butter without which it would fade into obscurity as a failed science. Which just might happen in the not so distant future in any case. Thanks ROM, I was thinking along similar lines as Homogenisation being a smoothing method specifically for climate modellers, how convenient eh? You are the first commenter to acknowledge the Australian satire in my name (which I did plagiarise from the comic Yonnie Stone of Punter to Punter fame) yes we called rocks yonnie’s also and your use of the term handle took me back to days on the CB radio. I wondered where Yonnie came from but was hesitant to ask! Now I know.. I love rocks and stones! That sounds in keeping with a UN “one world government – one world people” sort of ideal (sic). Can’t have outliers if that goal is to be achieved! After all, why not kick start that scam with a “one world climate policy”? Socialism is all about “everybody being equal”. (except me, I rule). You are correct, no outliers, no decenters. Other ideas, other opinions, other priorities confuse them. They can’t understand “other”. Two news headlines this morning. 1/ August sets heat records all over globe. How much longer will news outlets print these stories without questioning their validity. 2/ Bounce for Lib’s, lead Labor in polls. How fickle are the people of Australia, other than Turncoat ousting Abbott no changes in policies. How can personal hatred for one man (Abbott) make a difference on your voting patterns. Point 1 might not be off topic. Wait until Bob FJ has processed those August heat records. We may find that they are full of (snip) adjustments! Thanks Bob.Hard to get traction given these circumstances.We can only abide by truth- that in itself gives its rewards. The lame stream media are intensely interested, their interest is 100% employed in keeping the wool tightly pulled down over our eyes. I don’t know whether I should think of them as the advance guard or rear guard for those that would deceive us. This has gone on too long now for them to be blind to the truth. Bob, the linked graph is from the Japan Meteorological Agency. It looks like they have been homogenising as well or using data from agencies that do. When all this hits the fan the reputation of science is going to be trashed and there could well be anti-science movements established. Apropos the link to the SMH article – loved this bit. Australia’s mean temperatures in August were 0.61 degrees above the 1961-1990 average, with cooler conditions in the country’s south-east countered by unusually warm weather across northern regions. The surging temperatures are likely to feature significantly in the run-up to the Paris climate summit in late November and December. So they “homogenised” the OZ August temperatures to ensure that our hot tropics skewed the average for the southern states to make it the hottest eva! And the last paragraph sums it all up really. It stinks, doesn’t it? We’ve been really cold down here for months on end but our reality doesn’t rate against their vivid imagination. Salute and thanks to Bob Fernley-Jones et al. for an extraordinary piece of detailed analysis. We must at all times bear in mind that the end justifies the means. 31. We acknowledge that the United Nations Framework Convention on Climate Change is the primary international, intergovernmental forum for negotiating the global response to climate change. We are determined to address decisively the threat posed by climate change and environmental degradation. 33. We recognize that social and economic development depends on the sustainable management of our planet’s natural resources. 37. Sport is also an important enabler of sustainable development. ……..coming soon or shortly after 25th September, 2015 to a place near you. This is an old favourite of mine. CDO data v ACORN data for Bourke in Jan, 1939. Every day has been adjusted, dropping the overall average by 0.37C. Note the reduction of CDO temp for temperatures over 30C and raising of temp for those under 30C. Must have been a daily resiting of equipment. If you go to References at the foot of the post, try browsing through the ACORN station catalogue, and you will find that there are differences between different sites admitted therein. •	Some small moves, measured in metres are claimed to have significant effects. •	There is a case where the current station can be up to 4 degrees different to the nearby airport (Moruya Heads I think). thank Bob… it is interesting. And when the BoM homogenise an ACORN high quality station by merging data from lower status stations long distances away? And even stations with known UHI effects with urban open sites? Are you able to explain the many step changes which have no apparent basis in their site history for the >20 figures presented above? no I can’t explain it and I find homogenisation to be a peculiar process on many scales/parameters. This is a very comprehensive analysis on the manipulation of a large scale dataset. excellent ! Only once in my career have I been required to work in what is a “batch” change to a very large dataset and I quickly realized that without proper testing of the change algorithm or pre-analysis of the dataset it is very easy to introduce very large “systemic” errors into the output dataset. This is almost impossible to fix without further very extensive and time consuming analysis, and the “man hours” required to undertake such a task prevents one from assigning a high level of confidence in the final output dataset, in part due to the “human error” issue. I admire the BOM for attempting to correct their data (where applicable), but they seem to do it with a very broad brush (as is illustrated in the analysis above) and the “before” and “after” results of the change seem to indicate an algorithm that lacks sufficient complexity to handle the wide ranged context of data being changed. Obviously this data will be used as “input” into something else … not sure what though , as it almost unusable. Yes indeed, their algorithms are erh uhm a tad suspect. Part 2 of this series (See References in the post) shows for instance that there is an algorithm that underlies the daily data that has weird monthly steps in the annual cycle. That in itself is I think a rather strange way of creating a correctional seasonality effect*, but it becomes ridiculous when there are nonsensical “correction” leaps up or down from month to month. A worrying aspect is that it is presumably not deliberate, (because it is so bizarre), and that it has not been corrected by BoM staff. In correspondence that I’ve had with the BoM and the responsible federal minister, I’m advised that if I want my queries (or claims) investigated, then I must fund their investigation! * And anyway, how can they know that seasonal corrections are required over the past century? I did think that BoM’s response was unkind and considering that you have identified potentially serious problems with their homogenization process BoM should be paying you not the other way around. As for the application of ” seasonal corrections” to the historical data ? now that definitely raises more questions. Thanks for the great work, I will definitely take a look at series 2. So as not to be completely o/t maybe Bob can draught up an entry for this? What is the point in BoM having instruments all over the country? Is there something wrong with BoM’s instruments? They obviously don’t believe any of their readings. A poor tradesman is the one that blames his tools. ACORN tells me that BoM is blaming it’s tools, and has to spend all it’s funds on one big tool (head office computer), and staff to make it all up instead. Thanks, Bob, for giving us the real story of what looks like malfeasance, or is it just incompetence. What is the point in BoM having instruments all over the country? Indeed, why bother having instruments at all? They can just make up the data as they are already doing! In government “World’s Best Practice”? is a euphemism for “Agency’s Best interest”. “negative adjustments are somewhat more numerous for minimum temperature, which is likely to result in ACORN-SAT minimum temperature showing a stronger warming trend than the raw data do”… Blair Trewin 2012, International Journal of Climatology, page 1524. Instead of indulging in cherry-picking, or hypotheses about how the BOM meteorologists do not know how to do their job, compare the average unadjusted data with the average adjusted data. The tell-tale lingo of one schooled in Post Modern Virtual Science. PMVS. What a terribly sad state our education system and media has devolved into! This site runs on cherry picking and stone throwing. Its run by a biologist who knows better than the climate scientists. If it had any real evidence it wouldn’t be stuck in limbo with the same 2 dozen core regulars slapping down anything they dont like from the comfort of their’ armchairs. Cherry picking is acceptable, its the only way to prove our argument within this chaotic system. If it had any real evidence it wouldn’t be stuck in limbo with the same 2 dozen core regulars slapping down anything they dont like from the comfort of their’ armchairs. But Frank, every slap-down you get comes with clear and concise data. Rational arguments. Yet you never produce any data to back up your unfounded assertions. Just a lot of angry BS. Yes, the agenda of this website it pretty clear. All propaganda is. I show the big flaw in the latest hit-piece, then sit back and wait for it not to be addressed. Personally I don’t care (science takes care of it’s self), but I do dislike seeing the Australian BOM getting libeled. Any chance you could give an example of when and where the BoM has been libelled on this site? The whole article is libel. But I will post some quotes. Satire… not meant to be taken seriously… yes, that does describe your article and Bob’s analysis. In your thoughtfully constructed missives, if you were to compose them in a good word processor such as MS Word, (you would then need to copy-paste it to here), then if there were any words that you are unsure of in their meaning, you can use ‘Look Up’ to improve your credibility. For instance, of note, you should check out ‘satire’ and ‘libel’. Do you have any examples to support that rather vague claim? In this study there are more than twenty stations analysed and they all have daft data with multiple issues, some of them objectively bizarre (See table 1). Do you feel that that is cherrypicking? Did you know that very many “climate scientists” are founded in tertiary educations other than a field defined as climate science? If you check closely you see any variations before 1960 are adjusted downwards and any variations after 1990 are adjusted upwards. Check my post at #16 and see if the BoM can justify those daily changes with the methods it prescribes. Cherry-picking. You are focusing on one station for a limited period of time – what is your justification for doing that? What about the rest of the temperature record? All this shows is the BOM adjusted ACORN when they derived it from AWAP for that period of time. In what way is this the slightest bit interesting? ‘I show the big flaw in the latest hit-piece, then sit back and wait for it not to be addressed. ‘ I presume you mean the graph showing the difference between CDO and ACORN. I have addressed that above showing prior to 1960 (down) and post 1990 (up). Now why would that be? Bourke was just an example of changing daily raw temps for no reason other than to reduce the temp by almost 0.4C. So this means the BoM can adjust daily temps by upto a degree – based on what exactly? Perhaps Hairy is agreeing that the Bourke data are daft! But isn’t Bourke supposed to be a “top quality” ACORN site? If so, should not the BoM (perform the probably impossible and) correct that data, or delete the site record from ACORN and notate why? Perhaps Hairy as a true believer could request the BoM to do that, although as I’ve been advised in writing, he might also need to fund such corrections. Bob It is possible that Harry thinks that mistakes can only be corrected if found by the BoM themselves. Mistakes found by hard working volunteers like you should be confused and defended as unchallengable real science. If this theory is correct Harry would not want that problem to be fixed. Lets see. Here’s another ‘problem’ with ACORN, again with Bourke from 1999 to Aug 2002. I sure you can look it up but here is an example of BoM’s world’s best practice. I’m sure you get the picture, Harry. And your CDO v ACORN graph difference – have you checked that? BTW, sorry to call you Henry above – my mistake. “But isn’t Bourke supposed to be a “top quality” ACORN site”. Top quality ACORN site – in 1939…. I’ve addressed your issue you claim noone will address. I’ve shown you snippets of an ACORN site that doesn’t add up (and there are many more examples of this). The raw data has been homogenised, area weighted and then anomalised to a 1961-1990 average, it finally bears little resemblance to the original temperature/anomaly. This is why, when you check the temp maps in monthly summaries, the weighted regional averages do not match the actual raw data averages. And I’m sure Bob knows a hell of a lot more than either of us about ACORN sites. The problem appears to go back to the Bourke Airport AWS introduced in 1999, which replaced a manual station set up at the airport in late 1994. CDO data appear to show all the earlier temps officially recorded as ’rounded up/down’ temperatures – pretty difficult for an AWS to show whole figure temps. ACORN just copied these records without questioning the original data. Can we really trust the ACORN data set if the BoM can’t manage an anomaly like this? Why not ’99999′ it if not sure (as it does if data is missing)? BTW, thanks for all your hard work on the above. Why do you apparently feel that Joanne Nova is not a capable scientist and by implication does not understand proper scientific methodology? In your eyes does she not live up to the high standards of say Professor Tim Flannery who apparently was skilled in mammalian fossils? Frank is a scientifically illiterate, sniping troll. He has never had anything worthwhile to contribute to anything. Do you have anything specific or quantitative to say and of or to whom? As an engineer to me it looks like the BOM may have applied a calibration table against the dataset, that is, for each CDO temp there is a compensated result. Such a table can do compression or expansion of the dynamic range of the data. You could apply a test to the data, that is, for each CDO temp, sort the data into temp order and create a pivot table showing you the range of outputs for each input temperature. If my guess is right you’ll learn interesting things about data quality. If the calibration tables are consistent then you might be able to extract the transfer function they are using. At this point, no. I am still waiting for something interesting to comment on. The only thing your analysis says about the BOM’s adjustments is they make adjustments – hardly a startling conclusion considering they say so on their website. As to why they make adjustments, they also explain this on their website. That is an AMAZING statement for a non-climatologist to make with no evidence. There’s nothing much wrong with BOM’s description of what they should do. The fault is in their actual practices. Sure, but first, do you know what numbers are, because there’s a bit maths and stats in it. Instead of indulging in cherry-picking . . . and . . . One things have have learn over the years, some like to misrepresent (straw man) the process of homogenization. There’s no cherry -picking. Each station record is a seperate entity and so even if only one location was singled out, the evaluation would be both valid and sound. And there is no mis-representation of ‘homogenization’. The process itself, as defined by the WMO, is nothing more than data tampering. My challenge to them is come up with a better method if you do not like the BOM’s method. Your challenge is ludicrous. There is no better method of data manipulation. All methods are invalid. The well established, centuries old practice of utilizing the data as is when evaluating it, stands. It’s only the post-modern Feyerebend cultists that insist on manipulating observations to fit their agenda. The data is the data, and there is nothing you can do about that. As I have pointed out, on this blog before, “You can put a hat and lipstick on a pig, and it might make it look a little prettier in your eyes, but it is still a pig, that likes to do piggy things”. The process of homogenization is doing the same thing to the data. It is trying to tart it up a bit. The readings are series of discrete values, each series being about a discrete place. It is measuring the point temperatures, at a known frequency of observation. Those observations were, and are, intended to be of sufficient accuracy, to be useful within the close geographic area, where those observations are made. That is as good at the data can get. It cannot be made any better. You cannot improve its accuracy by introducing extrinsic factors. Factors, such as other geographic areas and habitat. The process of homogenization is just fudging the fact that there is really no way of turning discrete observations into a continuous record, without loss of accuracy. Try a mind experiment: What was the mean temperature of the entire earth last Wednesday? If you can produce an average temperature for a country, doing if for the whole earth is only a matter of scale. The more you play with the numbers, the more divorced from any useful reality they become. If you torture the figures for long enough, they’ll confess to anything. Your link only provides BOM rhetoric justifying adjustments, how about you provide 100 years of actual raw data starting from 1910 to compare with the adjusted data from BOM for an honest comparison. I did, follow the link I gave to the BOM methods. There is also description in their FAQ, I assume people know how to read a website. “Your link only provides BOM rhetoric justifying adjustments”. Yeah what would the BOM know about their own data, the big dummies. It is a symptom of confirmational bias that NO explanation is usually accepted once the bias becomes entrenched. Anyway you have a lot of work ahead of you. First define what you mean by an “honest comparison”, than do it. Good luck. Thanks for schooling us on “confirmation bias”, now let me tell you something even more powerful, “noble cause corruption” and plain old human stupidity. Look them up. I’m just calling ‘strawman’ on you Twatter. Harry Twinotter. Why do you need to be spoon fed? Bob has laid it all out for you and you refuse to see. Still waiting for someone to make the comparison, and comment on the point I raised. Tick, tock. Tick tock. Tick tock. Oh well, onto the next silly denialist article then. Pass the time with tanties while you wait for someone else to carry out your irrational demands eh? Do you have anything specific or quantitative to say and to whom? Refer to my above comment. Harry You have confused AWAP Raw and Raw data. AWAP raw is not raw data. Yes derived from AWAP raw not raw data. AWAP is not raw data. Twatter is referring to his ‘strawman’ argument. thank you for your dedication. amazing, but not surprising. WUWT: How reliable are the climate models? So clouds are the problem? Not CO2? That was the intent of IPCC, Inc.! So let’s lay it all out a bit. They claim that CO2 causes ‘back-radiation’. What Mike Jonas is saying is that because more clouds also means more precipitation, i.e. more rain, and because more rain will cool the surface, clouds should have been assigned a net cooling, not warming! But, as Mike has snown, that didn’t fit with the purpose of the models and so IPCC, Inc. decided that clouds should be net warming! neats should be heats in “The ‘back-radiation’ (sic) then heats up the surface of the Earth … “. Bob Fernley-Jones has done a sterling job but my reservations are more fundamental; I think the entire enterprise of trying to detect an overall regional or global surface temperature trend from a vast collection of individual measurements over 100 + years, even if they were all diligently read and recorded — a trend well beyond the the observational limits of the instruments used — is pointless, meaningless and useless. Find the mean height between the tallest and shortest adult in each town in Australia. Work out the average of all those. Do it again every year for a century. Avereage all those. You end up with a meaningless number that tells you nothing about the height of adults in Australia in the last century. Then compare it to a century by century chart of the last 10,000 years. Give yourself a PhD in height change science. Gary that method would produce a hockey stick trend. Bob, your charts comparing before and after are such a simple way to check reasonableness, as you call it, without need to know what the data actually refers to. The secondary comparison, checking whether the dates of differences between source and resultant data tables relate to dates of documented physical alterations of the measuring instruments, that also doesn’t require knowledge of whatever substance is being measured. They’re both tests of whether data modification procedures of lists of numbers are likely to have been reasonable. Or maybe Hairy has sufficient intellect to comprehend but behaves rather like those protestors who turn up regularly at many street marches no matter what they are about and have a reputation of being ‘Serial Pests’? Having worked at Cairns Airport for many years, I have no doubt that the shift of the site from the original position of the instruments would have a noticeable result in an increase in temperature records. It was originally situated on the eastern side of the runway behind the original Control Tower on a patch of grass under the shade of a palm tree. In late 1984 with the re-development of the airport my office was moved to the opposite side of the runway, along with the new passenger terminal. I wasn’t aware that the instruments were later moved to the same area, but what I can say is that , that side of the airport, particularly following the building of an additional International terminal, became a treeless area of hectares of Tarmac carparks, roads and concrete runways, which would have definitely altered ambient temperatures, both day and night with the additional heat retention of these areas. Also the huge increase in traffic meant the heat generated by jet engines was exponentially increased. Ansett alone went from handling 4 domestic flights daily and on small international aircraft a week, to 12 daily domestic flights and 60 large international jets a week. If Harry Twinotter is still around, perhaps he might explain it to us?